A painter, Bernard M. Keyes (1898-1973) was trained at the School of the Museum of Fine Arts where he was mentored by Frank W. Benson. He also studied at Harvard University’s Fogg Art Museum where he was awarded a traveling scholarship. 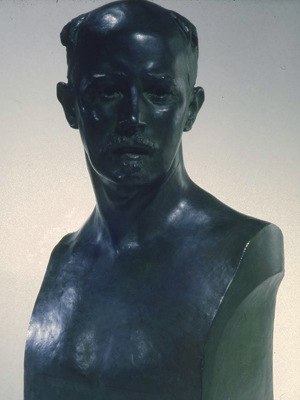 Upon his return to America in 1922 he began to teach painting classes at the SMFA. Allen and Keyes became colleagues. Art in Transition by Pierce lists him as head of the department that taught Perspective from 1927 on, a required course. 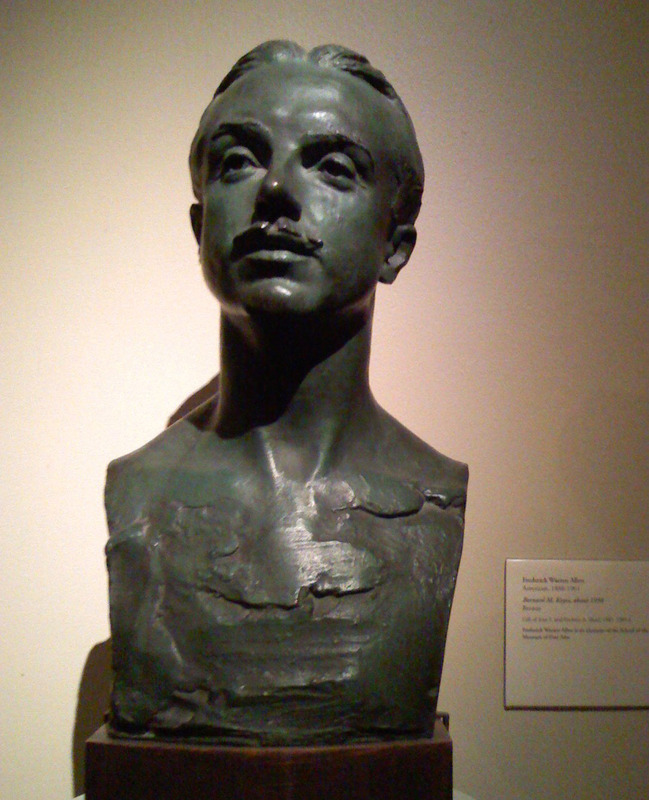 This bronze bust was cast about 1930 and was later given as a gift by the Sharf family to the Museum of Fine Arts. 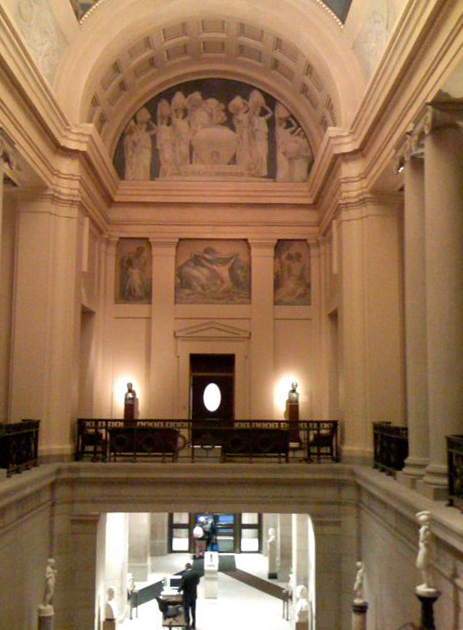 It was on display on the floor above the rotunda of the MFA in 2008 where it flanked the doorway paired with a bust of Charles Grafly, the predecessor of Frederick Allen as Head of the Sculpture Department. The Keyes bust is the lighted piece on the pedestal to the right of the door with the oval shaped glass. 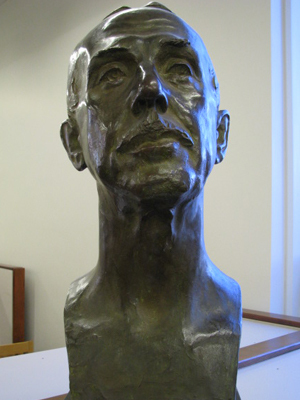 Compare this bust Allen’s portrait of William Isaac Cole at Wheaton College sculpted in 1927 and his self-portrait bust from 1919. All three illustrate the principles he taught: a strong inner structure with movement in the details of the surface forms, the neck centered under the skull. “The portrait is in the back of the head,” and “the features or muzzle will forever be wrong unless the skull and neck are first properly studied both in action and structure.” Details should be interestingly modeled in relation to the solids underneath. His style was based upon the esthetic of the Boston School of Artists who trained him, that of ideal beauty with truthful and natural representation, crafted with sophistication and executed with skill in the academic disciplines. His use of the clay in modeling this portrait is somewhat impressionistic in the play of light to suggest forms without completing all the details. 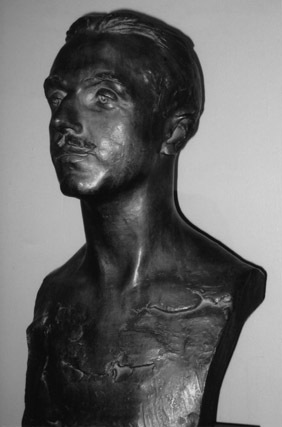 His skill in creating likenesses is evident here and his mastery over this art form shows the legacy of his training with Bela Lyon Pratt, his close association with Charles Grafly, and his study of the portraits of the masters Auguste Rodin and Pratt’s teacher, Augustus St. Gaudens. 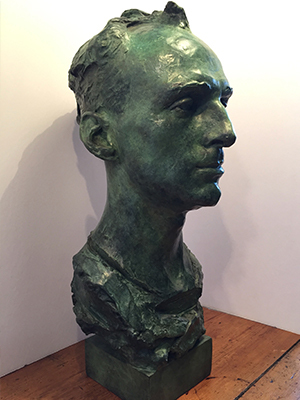 Provenance: Allen to Bernard Keyes to Margaret K. Smith (sister), to Alfred J. Walker Fine Art who sold it to the MFA with funds donated by the Sharfs. I have a Keyes painting from pre-1923, sold to my grandfather by Henry Lawrence Doyle, It is of a girl with a small elephant. I have pictures of his workshop. Very cool. You may have seen the Allen direct carving of the Elephant. He loved sculpting animals, so this painting by Keyes of an elephant is an interesting connection that could be made between the artists. I would love to see the painting and the pictures of his studio. An studio always says so much about the artist ! old friend & neighbor of of my family as we lived next door and became quick friends. I have searched trying to find the work of elizabeth mc lean smith it would be such a nice treat for my family to see her work again.. I recall the releif bas being created in her home on Russell St. As I recall, the bas consisted of 2-3 sections. it depicted a colonial scene of common everyday activites in the town/settlement. Families walking about in the market places. Ms Smith pointed out a father and daughter and Betty said that the two were of me & my father. Needless to, its close to our hearts. When inquire at locations some Betty\’s works are suppose to be we are never given a response. How do we get these museums to answer us. Elizabeth MacLean Smith was a long-time assistant to Allen, both in his studio and in the classroom. Her essay about him and his teachings are extremely informative and insightful. Without that document, we would not have information about how he taught sculpture and what he taught. Have you contacted the School of the Museum of Fine Arts? Their librarians are very helpful. Please share with me anything you find about her so I can include the information in the upcoming monograph about Allen\’s life and work.